Anonymous Crime Reporting Services | WeTip, Inc.
WeTip Inc. provides the anonymous crime reporting hotlines throughout the entire United States, including Hawaii, Alaska, Puerto Rico, the U.S. Virgin Islands, along with portions of Canada and Mexico. The internet crime reporting resource will provide the anonymous tip system worldwide regarding any major crime including violent crime, property crime, fraudulent and corporate crime and fraud as well as terrorist activity, foreign or domestic. For every conviction, there is one less threat against you and your loved ones. WeTip is not only making news, WeTip is making history. Live Operators staffing the phone, never an answering machine or answering service. No taping, tracing or caller ID. NO phone logs, No information on the informant, only on the suspect. Multi-jurisdictional hotline service, regardless of city, county or state lines. Caller NEVER needs to identify any membership data to leave a tip. Artwork for posters and Brochures, newsletters and metal signs. WeTip has over 1,000 members across the nation. 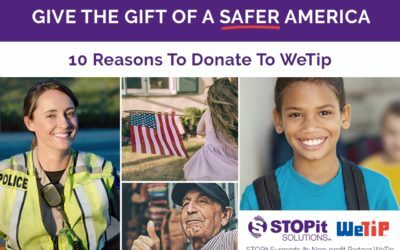 WeTip provides its crime fighting service to city, county, corporate and school members. Since 1972 WeTip has established relationships with local authorities in connection to all of these members to help aid when a tip is received.